The consortium of the Responsible-Industry project launched some months ago a call for papers for a special issue of Sustainability (ISSN 2071-1050). The deadline for manuscript submissions has been extended to 1 November 2017. Chatfield, K.; Iatridis, K.; Stahl, B.C. ; Paspallis, N.	Innovating Responsibly in ICT for Ageing: Drivers, Obstacles and Implementation. Sustainability 2017, 9, 971.
that is organized by the European Economic and Social Committee (EESC), the European Institute of Innovation and Technology (EIT) and the Responsible-Industry project consortium at the EESC premises in Brussels on 18 and 19 May 2017. For registration (deadline 16 May 2017), programme, contact and further information, please follow this link. to be held at the EESC premises, in Brussels, on 18 and 19 May 2017. Program and registration will follow soon. Join us in the discussion at the EESC premises on 18 & 19 May and share your view. Call for Papers: Special Issue "Responsible Research and Innovation (RRI) in Industry"
The consortium of the Responsible-Industry project has launched a call for papers for a special issue of Sustainability (ISSN 2071-1050). Deadline for manuscript submissions: 30 June 2017. For several years Responsible Research and Innovation (RRI) has been widely discussed, especially in the European context, but also in academic conferences and publications. Numerous EU projects under the FP7 framework, as well as in the Horizon 2020 program, have been conducted, or are currently ongoing. Despite this significant attention, the focus of RRI was mainly on publicly funded research and the generation of recommendations for policy. There was less attention on practical ways of implementing RRI in companies. Due to the importance of private businesses in undertaking research and in particular innovation, the RRI discourse should cover the role of industry more explicitly. A key question is how RRI relates to other activities that may be of ethical or social relevance, such as corporate social responsibility. This Special Issue of Sustainability therefore offers a forum for dissemination and discussion of the relationship between RRI and industry. Our definition of industry is broad, including companies of all sizes and industries, including the service sector. We welcome conceptual, empirical or experimental results that are discussed in a national or international context. Industry-specific RRI implementation, e.g., healthcare, ICT, etc. RRI in an international context, e.g., Europe vs. U.S. The recently launched European COMPASS project invites the submission of success stories of responsible research and innovation in industry, in particular for the two key innovation fields nanotechnology and healthcare. Five winners will receive €3,000 each. Small and Medium-Sized Enterprises are particularly invited to apply. The deadline for submission of abstracts is 31 October 2016. For more details on this competition see the PDF file below. The Responsible-Industry project consortium has published an introductory video to Responsible Research and Innovation in the ICT industry related to health and ageing. The video is available in Youtube. 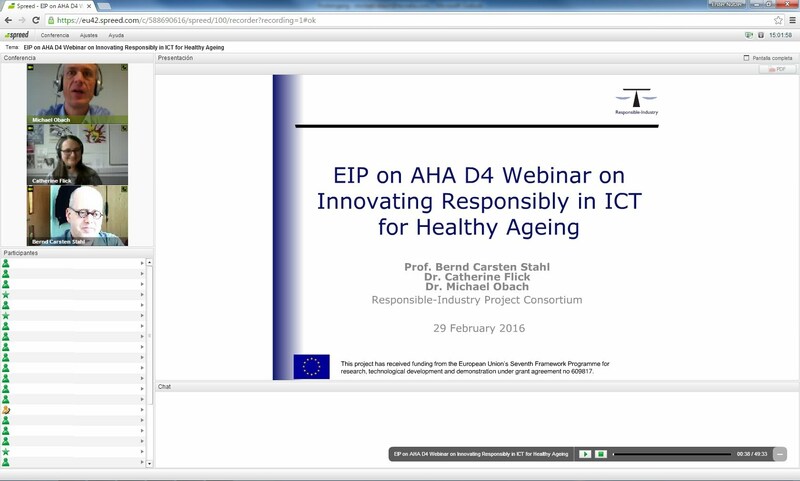 The Responsible-Industry project consortium, in collaboration with the Action group D4 of the European Innovation Partnership on Active and Healthy Ageing (EIP AHA) and the PROEIPAHA project, presented a webinar about "Innovating Responsibly in ICT for Healthy Ageing" on the 29th of February 2016. The project RRI Tools published an interview with Prof. Bernd Carsten Stahl, the leader of the Responsible Industry project, entitled "Business and industry towards a responsible innovation: ICT in ageing". Prof. Stahl explains how business and industry can benefit from Responsible Research and Innovation: it helps them to comply with regulations and it sets them apart from their competitors. In particular, ICT may help dealing with ageing issues, but we have to think in a proper way how to innovate responsibly.